How will a tolerance ring help with thermal growth & contraction? When materials have different coefficients of thermal expansion (CTE), the annular space between them will expand and contract with temperature changes. A tolerance ring placed between the inner component (i.e., ball bearing) and outer component (i.e., aluminum or plastic housing) will act like a radial spring and compensate for the growth and contraction occurring between the different materials. This provides the holding or “mating” of cylindrical components throughout temperature ranges. Will a tolerance ring keep components centered ? In most cases, the tolerance ring should maintain about 0.0008” concentricity for components up to 2” in diameter. The concentricity is also dependent on how accurate the center axes of the components (i.e., shaft, housing bore) were made. What are the maximum temperatures that tolerance rings can endure and still retain their initial elastic spring-like characteristics ? This is dependent on the raw material used to make the ring. For carbon steel, the max temp is 250 °F [120 °C] continuous exposure and up to 340 °F [170 °C] for brief peaks. For 301 stainless steel, the max temp is 480 °F [250 °C]. 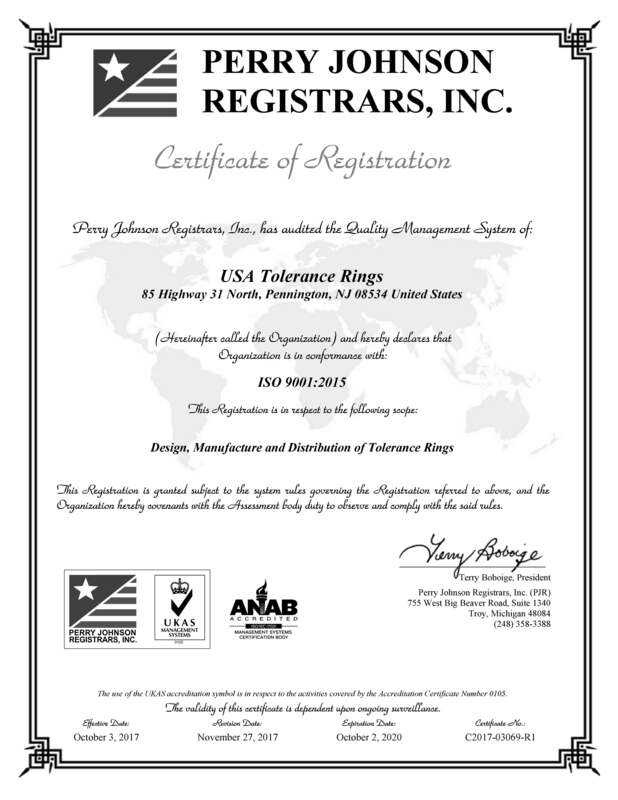 Tolerance rings made of Monel® alloy K-500 have been used successfully up to 600 °F [315 °C] and Hastelloy® C-276 have been used successfully up to 900 °F [480 °C]. What should be the surface finish of the components at the tolerance ring interface ? The desired surface finish is often dependent on several characteristics. A particular surface finish for one application, may not be suitable for another. Therefore, it is best for the customer to determine a suitable surface finish based on machining capabilities and prototype performance. However, as general starting guidance, typical component surface roughness at the tolerance ring location should be a good machined surface from 32 to 63 micro-inches [0.8 to 1.6 micrometers] or Grade N6 to N7. Will tolerance rings act as dampers and reduce vibration/noise ? Tolerance rings behave like springs and will not dissipate energy. As springs, however, they will shift the vibrational frequencies occurring at the components. If the shift is away from to the natural vibrational frequencies of the system, then there will be a decrease in vibration/noise. If the shift is closer to the natural vibrational frequencies of the system, then there will be an increase in vibration/noise. The best way to confirm either way is by testing prototypes. What type of tolerances should the components have? For elastic applications (i.e., thermal growth) and depending on the tolerance ring configuration, total radial tolerances of the components may typically be up to 0.0015” for small rings (≤ø 1/4”) or up to 0.015” for large rings (≥ø5”). How high is the wave height on the ring? The wave height can be varied within limitations of pitch, tolerance ring diameter, material thickness and tooling. Common nominal wave heights are 0.33mm[0.014”], 0.5mm[0.020”], 0.75mm[0.030”], 1mm[0.039”], 1.25mm[0.049”], 1.5mm[.059”] and 2mm[0.079”]. Typically, the maximum radial annular clearance between components would be close to the wave height.